The Trinidad Moruga Scorpion pepper is native to the district of Moruga on the island of Trinidad. The fiery pepper gets its name from the pointed end of the pepper which resembles a scorpion's stinger. The scorpion pepper clocks in at an impressive 1,463,700 average Scoville heat units which is noticeably hotter than the Bhut Jolokia "Ghost Pepper". 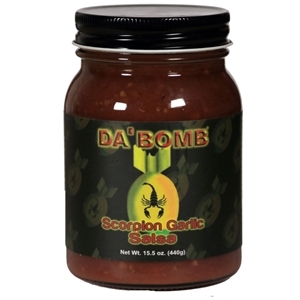 Da' Bomb team of Chilehead alchemists have created a smooth cantinastyle salsa with a hearty dose of savory garlic and enough Scorpion pepper to deliver a sting worthy of the Da' Bomb name. Ingredients: Tomatoes, tomato juice, water, apple cider vinegar, onions, jalapenos (jalapeno peppers, distilled vinegar, salt and acetic acid), garlic, scorpion peppers, salt, tomato paste, garlic powder, spices, onion powder, citric acid, calcium chloride.